The fire service stands on a long tradition of helping in times of need. The Oak Hill Fire Department strives to continuously provide a high level of service delivery for the community. One of the most important aspects of what the Department does for you is to serve in as many ways as we can to ensure your safety. Preventing emergencies is one of the most effective ways we have to help you. Tours of the fire stations and receiving safety and preparedness information is encouraged; just give us a call to schedule a visit. A robust training program is another way the Department prepares itself to better serve you. Always ready at a moment’s notice, when you need help, we’re here for you. 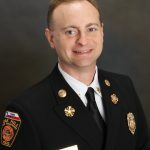 Jeffrey J. Wittig was appointed as the Fire Chief of the Oak Hill Fire Department in January 2012 by The Board of Commissioners of Travis County Emergency Services District #3. Chief Wittig’s tenure with the Oak Hill Fire Department began in 1996 as a volunteer firefighter, promoting through the ranks of Firefighter, Firefighter II, Lieutenant, and Captain until he became a member of the full time staff at the rank of Captain in 2005. He was promoted to Assistant Fire Chief in 2006 when he assumed full management responsibilities of the Fire Department’s administration. 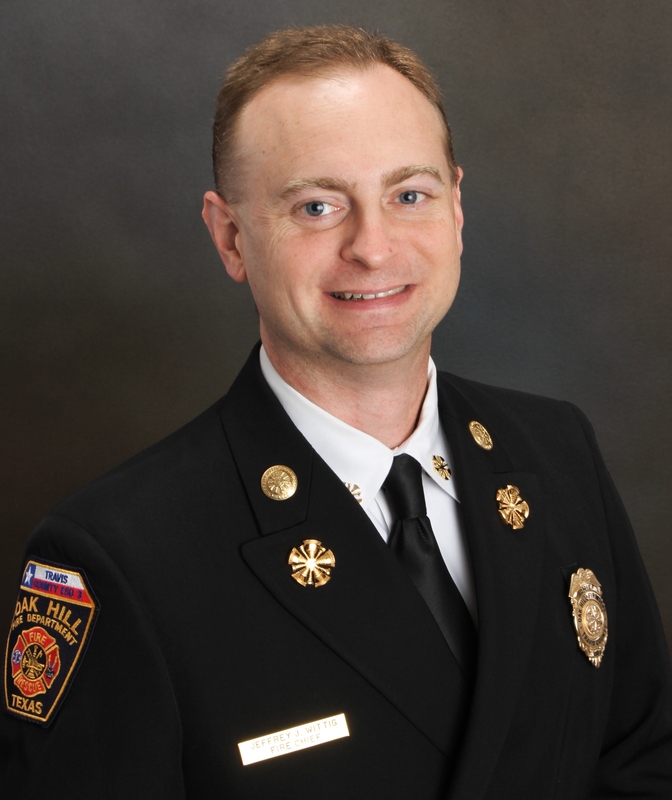 Chief Wittig served as the Acting Fire Chief from November 2011 until his appointment as the Fire Chief in January 2012. Chief Wittig continues to impact the Fire Service through his Chief Fire Officer Designation from the Center for Public Safety Excellence, his completion of the Chief Fire Executive designation from the Texas Fire Chiefs Academy of the Texas Fire Chiefs Association, and his completion of the National Fire Academy’s four year Executive Fire Officer Program. The Chief Fire Officer (CFO) program is a challenging peer review process that measures a candidate’s performance against international standards in many aspects of fire and emergency services competencies and community impact. The Chief Fire Executive (CFE) program is a two year multi-week in-residence program that establishes credibility and training for the state’s fire service leaders. The National Fire Academy’s Executive Fire Officer (EFO) Program challenges attendees to make a positive impact in their home communities and the fire service in general through research projects related to the topic of each course of study. The four year multi-week in-residence program is one of the most challenging and competitive programs in the nation. Chief Wittig’s EFO Program research can be reviewed below, demonstrating opportunities to improve the level of service and effectiveness of the Oak Hill Fire Department and other emergency response agencies worldwide. Chief Wittig holds certifications as Department Head of Suppression, Master Firefighter, Fire Officer IV, Master Fire Service Instructor III, Hazardous Materials Incident Commander, and Incident Safety Officer from the Texas Commission on Fire Protection; Emergency Medical Technician-Basic from both the National Registry of Emergency Medical Technicians and the Texas Department of State Health Services; Juvenile Firesetter Intervention Specialist II from the Texas Fire Marshal’s Office; and Communications Unit Leader from the Department of Homeland Security. Chief Wittig has also been appointed to serve as one of seven Branch Coordinators for the Texas Intrastate Fire Mutual Aid System (TIFMAS) with responsibility for coordinating Texas Fire Department resources from 24 counties in the Central Branch for deployment across the state to all hazards incidents. He also helped create the TIFMAS Foundation, a non-profit organization established to support the TIFMAS program and now serves as the Foundation’s President. Chief Wittig was born in Victoria, Texas and moved to Oak Hill in 1978. A 1992 graduate of Austin’s Bowie High School, Chief Wittig also earned the rank of Eagle Scout from Oak Hill’s Troop 395. After receiving an undergraduate degree in Psychology from The University of Texas at Austin in 1995, Chief Wittig began a 10 year career in procurement and management at The University of Texas. He received his Master of Business Administration Degree from the University of Phoenix in 2005. Chief Wittig engages in the community through various memberships and affiliations that strive to help bring a professional presence to the community outside of times of an emergency. Chief Wittig serves as an Assistant Scoutmaster of Boy Scout Troop 395 in Oak Hill, sings on the Praise Team at the Western Hills Church of Christ, and also serves as Treasurer for the Oak Hill Business and Professional Association as well as Treasurer for the Oak Hill Young Business Award (a 501(c)3 organization created to award scholarships that encourage entrepreneurial skills in the youth of Oak Hill). The Oak Hill Fire Department is recognized as a leader in firefighter and emergency medical training through its Training Division and the Oak Hill Fire Academy. The Department is also held in high esteem for its administrative operations by its peer organizations and auditing firm. The Department is overseen by its Board of Commissioners, which continues to provide direction and support to maintain the exceptional level of service delivery currently enjoyed by the citizens of Oak Hill.